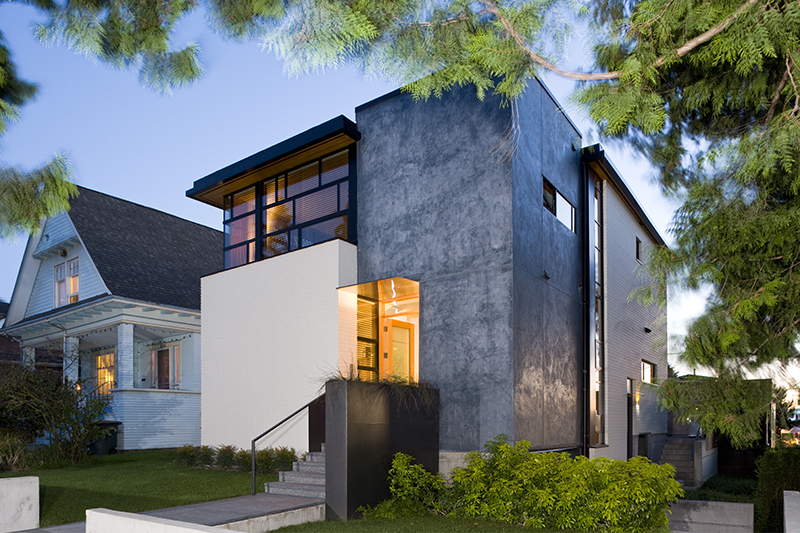 Lane Williams Architects is a small team of architects devoted to the creation of custom, single-family residences, both new construction and major remodels. Lane Williams, AIA, has designed over 100 houses and received 20 awards for home design, including three AIA/Seattle Times Home of the Year awards plus nine additional nominations. His works have been featured in countless national and regional publications and highlighted in national and international design blogs and websites. Our remodel experience includes renovation of mid-century modern homes by renowned Northwest architects Al Bumgardner, Paul Hayden Kirk, Ibsen Nelson, and Roland Terry. Our work has taken us to Oregon, California, Michigan and Connecticut. Each project is created in close collaboration with the owners and is carefully tailored to their needs. Our motto is “Architecture for Living” with emphasis on comfort, durability, sustainability, and a close connection to our beautiful Northwest landscapes. Lane takes the design lead of each project, assisted by project managers Marlo Brown, AIA, Trevor Dykstra and Kellen White. Each of them is a registered architect in the State of Washington. Marlo has a Bachelor of Arts in Architecture from Smith College and a Masters in Architecture from Columbia University. Trevor has a BS in Environmental Design and Master of Architecture Degree from Montana State University (2005). Kellen is a graduate of the University of Washington (2005), with a Master of Architecture degree from the Illinois Institute of Technology (2010). Lane Williams' first custom home design, created in 1986, wins the AIA/Seattle Times Home of the Year Award, followed by a Pacific Coast Builder's conference award for Best Custom Home, establishing Lane as a voice in Seattle's emerging modern home design realm. Lane becomes a Principal Architect in a 25 person firm, where he is responsible for several more new home designs. Lane moves into his own new custom home on Seattle's Queen Anne Hill in 1988, with another nomination for the AIA/Seattle Times Home of the Year Award. Lane Williams Architects opens its doors, located in the lower level of Lane's home, and Lane is joined by the first of his many intern architects. The first completed design by Lane Williams Architects is honored with an AIA/Seattle Times Home of the Year Award in 1993, followed by another in 1995. The winning project is featured on the cover of Pacific Magazine, one of several cover stories featuring our work in regional publications. The firm grows to Lane plus three staff and moves to larger quarters in Lane's second home on Queen Anne, a mid-century modern brick home on the south slope. We complete our first out-of-state projects and our work becomes widely published in national magazines. Our staff outgrows the house and we temporarily rent offices nearby while Lane seeks another property. Our studio is relocated to new offices next to Lane's third home on Queen Anne, a new house at the intersection of First Avenue North and McGraw Street. Jill Lewis, AIA, becomes a Principal, after many years on our staff. The company is given a new name, Coop 15, referring to our "coop" at 15 McGraw Street. Jill leaves for new opportunities in China, and later settles in Argentina. Lane's fourth home is at 2214 Queen Anne Avenue North, in a renovated 1907 residence that was formerly a clock repair shop, and our offices occupy the main floor. Our work is now a frequent feature on national and international websites and design blogs, such as ArchDaily and HOUZZ. Lane's fifth home on Queen Anne is a remodeled 1925 Brick Tudor, at 2420 8th Avenue West, with offices once again located in the lower level. By now, 12 of Lane's former staff have gone on to successfully start their own firms—but Marlo Brown, Trevor Dykstra, and Kellen White still remain! "Cle Elem Vacation Home Offers Getaway"
"Design is Clean, Contemporary, Open"
"View Home in Somerset is Set Up For Casual Living"
"Metal Sculpture on Lush Green Site"
"A Seamless Blending of Old, New"
"Making Most of Little Lot"
"A Complex House of Surprises"
"The Big And The Beautiful"
" House With Sculpture and Water In Mind"
"Historic Facade Conceals Thoroughly Modern Interiors"
"A Bridge Between Two Worlds"
"Sculptural Feel Fits Wooden Site In Preston"
"Redmond Home Reflects Site's Timber and Emphasizes Japanese Theme"
"Clean, Spare, Original Define Home Of The Year"
"Judges Intrigued By Alternative Architecture"
"The Feeling Of The Town"